What is thermal break aluminium ? Are uPVC Doors/Windows environmental safe? Easy Home Insulation Tips ! There is a famous song by singer-songwriter duo Simon & Garfunkel , " Sound of Silence". It is one of the song which I liked most & perfectly fit in India's metro city life right now. But can we achieve absolute silence in a Home ! Can we control outside noise level & feel Himalayan abode in our Home ? 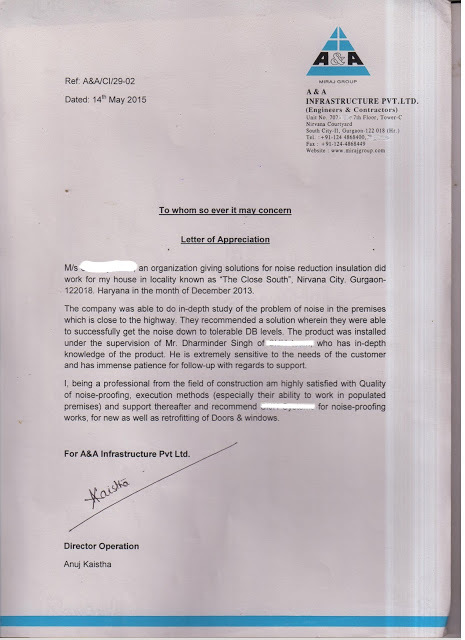 yes it is possible... We did it many times..sharing one case study.... Residence @ Unitech South City II, Golf Course Road, Gurgaon. 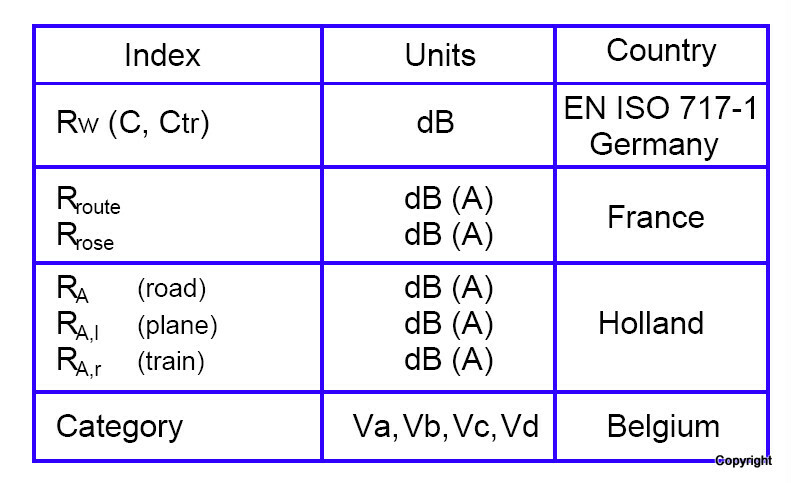 In my previous post, I have shared sound terminologies & ill effects of noise. 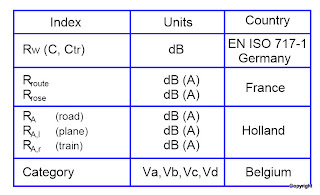 There are different standards & Indexes to measure noise levels.. I being associated with a German MNC always like to follow DIN ( German ) norms which are safest & highest in Quality. After visiting the site, I realized that it was quite terrible situation as noise levels @ that House was around 60-65 dB during day time & also in the night, it was 70-75 dB with existing aluminium doors & windows. Regularly review the City Plan rules relating to acceptable levels of noise. To ensure the quality service is provided for enforcement, response & complaints. To develop the noise map of Delhi NCR and monitor trends over time. To develop a system that identifies areas of concern. e.g. residential areas which are near motorways and other road network. Removal of existing Doors/Windows - As family was residing their, We need to complete the house same day as they can not keep their house remains open in the night.
" Listen to yourself not the noise of the world, only you know what is right for you." These guys are doing excellent Job. Don't be fooled by thinking that your ears are “tough” or that you have the ability to “tune it out”! Noise-induced hearing loss is usually gradual and painless but, unfortunately, permanent. Once destroyed, the hearing nerve and its sensory nerve cells do not repair. Exposure to noise can also cause a temporary change in hearing (your ears may feel stuffed up) or a ringing in your ears (tinnitus). However,repeated exposures to loud noise can lead to permanent tinnitus and/or hearing loss. Loud noise can also create physical and psychological stress, reduce productivity, interfere with communication and concentration. Continuous Exposure to noise environment also limits your ability to hear sounds, understand speech, and seriously impairs your ability to communicate. Do we have contact details of these guys, I am looking for similar solution for my home. what was the specification of the glass used? It will help if you tell us how noise control was achieved with choice of glass too. I can see that you are an expert at your field! I am launching a website soon, and your information will be very useful for me.. list of private schools in delhi Thanks for all your help and wishing you all the success in your business. I am very much pleased with the contents you have mentioned. manan vidyaI wanted to thank you for this great article. How to sound proof windows in India ? How to buy uPVC Door/Window in India ? Case study-Door/window with security grills in Lucknow, U.P.